Tabrina Ferrell being checked on by officers after she fell onto the tracks. A New York City man jumped into action Sunday evening, rescuing a toddler who had fallen onto the subway tracks and under a shuttle train that had stopped in the Times Square station, the New York Daily News reports. 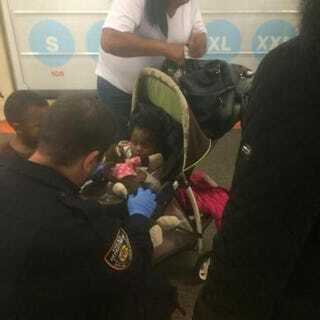 Tabrina Ferrell, who is just 1 year old, sent her grandmother and fellow commuters into a frenzy when she fell off her stroller and slipped into the gap between the train and the platform as her grandmother, 49-year-old Pamela Ferrell, was trying to carry her off the train with the help of another passenger. Luckily, 54-year-old Herman McGarrah was there and quickly jumped into action, following the child into the gap and crawling several feet to reach her. McGarrah called it his “redemption,” detailing his struggle with homelessness, drug addiction and crime. “My life hasn’t been in vain,” he said. As for Tabrina, the little girl bumped her head and had a cut, but overall, she’s doing just fine. “She’s walking, dancing and playing,” Tabrina’s mother, Shacora Ferrell, told the Daily News.